Eating blueberries on a daily basis could lower both systolic and diastolic blood pressure in just eight weeks, according to researchers at Florida State University. "To our knowledge, this is the first study to evaluate the effects of blueberries on arterial function as was done in this study, as well as in this study population," says corresponding author Dr. Bahram H. Arjmandi of FSU. "These findings suggest that blueberries may prevent the progression to full-blown hypertension." Postmenopausal women were selected for the study because their incidence of high blood pressure exceeds that of men, and participants were considered to be in the early stages of hypertension. Working with 48 participants, the research team randomly assigned them to receive either 22 g of freeze-dried blueberry powder, the equivalent to approximately one cup of fresh blueberries, or 22 g of control powder. 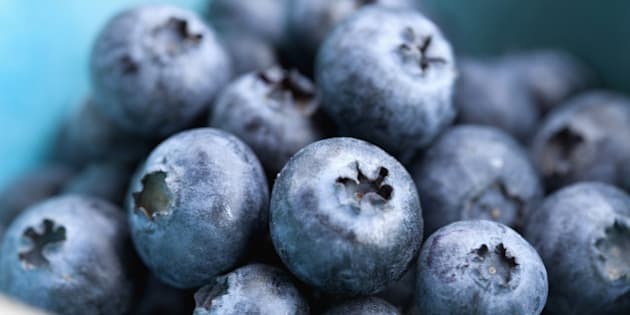 Upon conclusion of the eight-week study, the blueberry group's collective systolic blood pressure (SBP) was lower by 5.1 percent and their mean diastolic blood pressure (DBP) was lower by 6.3 percent. Arterial stiffness was measured using non-invasive pulse wave velocity technology, and the blueberry group showed improvement, for which researchers believe nitric oxide is to credit since levels increased from 9.11 to 15.35 micrometers (μM). The placebo group saw no corresponding lowering of their blood pressure, and their nitric oxide levels did not increase. Aortic stiffness was measured using carotid femoral pulse wave velocity (cfPWV) technology and showed no change in either group, indicating that dietary changes could have more effect on small, peripheral arteries than they do on central ones. "The recommended intervention for controlling blood pressure in pre- and stage 1-hypertensive individuals is not pharmaceutical interventions, but rather lifestyle modifications including dietary approaches and there is evidence that many cases of HTN can be prevented and treated through diet and lifestyle changes," says lead author Dr. Sarah A. Johnson of FSU. "Considering the prevalence of HTN in the U.S., preventive strategies such as dietary modifications (e.g. functional foods and dietary supplements) that aim to improve HTN and its related complications are warranted." The study was published in the Journal of the Academy of Nutrition and Dietetics. Recently, a Finnish study concluded that wild blueberries could neutralize a high fat diet, which is thought to occur due to the high concentration of polyphenols they contain.